This enormously large brass statue represents Lord Shiva in a dance mode usually identified as the ’Ananda-tandava’, and the form of Shiva engaged in it, as Nataraja. The elegantly conceived image of Lord Shiva, passionately engaged in dance with his right leg placed on the figure of Apasmarapurusha, and left, turned to the right and shot into space, has been installed in a fire-arch rising from a lotus pedestal and is topped by a Kirti-mukha motif symbolic of good and auspiciousness. There enshrines on figure’s face a divine bearing and in its anatomy – unfurling locks of hair and various body parts, the ecstasy of dance. Though all four arms of the figure are gesticulated in tune with the dance-move, each has been conceived to reveal also its own function and significance. In his upper right hand the figure is carrying a drum, while in the upper left, the flame of fire. The lower right hand reveals the gesture of ’abhaya’ – redeeming from fear, and the lower left, the gesture of dissolution. The fire-arch consists of flowing creepers and emits from each of its parts the flames of fire. Excellent anatomical proportions, well-defined features, elaborate ornamentation with a gorgeous tall crown alternating 'jatamukuta', define the image of the great Lord. 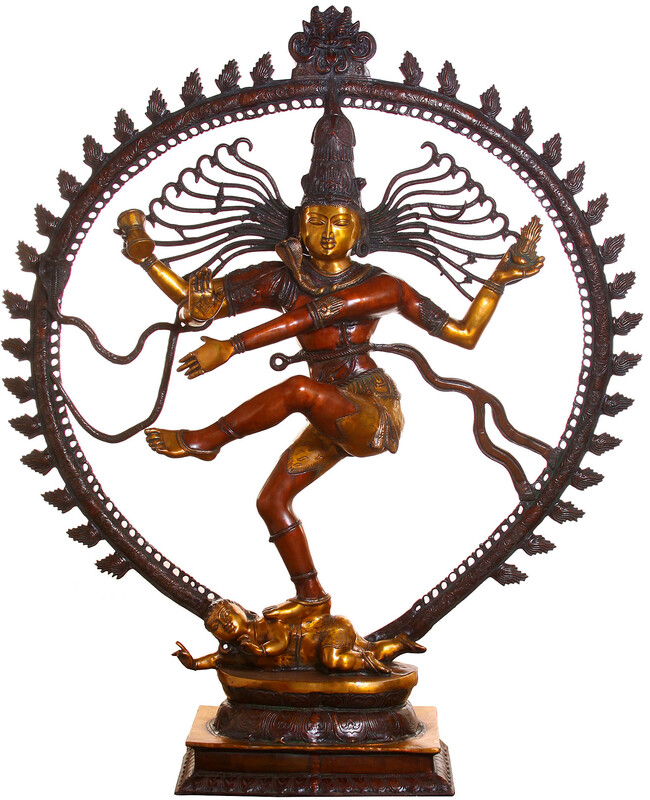 The term Nataraja, a form of Shiva exceptionally popular in Shiva’s South Indian iconography, is a combination of two terms, the ’Nata’ and ’Raja’. Litarally, Raja means ’king’ and ’nata’ means variously a ’dancer’, ’stage performer’ and sometimes also an ’acrobat’; thus, Nataraja means king of the dancers. Shiva is known to have danced not only to create and destroy, or to delight, but also to teach dance and hence the tradition revers him as the first of the dancers and as the dancers’ ever first teacher – 'Adiguru'. Thus literally the term Nataraja, Natesh or king of dancers, has the same connotation as has the epithet Nratya Dakshinamurti – one who is 'daksha' or expert in dance and music, Shiva’s overall accomplishment in dance. However, in Shiva’s iconography, the same as here in this statue, unlike Natesh or Nratya Dakshinamurti, the term Nataraja and its corresponding form has largely rigidified as the manifestation of 'Ananda-tandava' – the dance of dissolution, which Shiva performed when destroying the world after the Great Age. The entire iconography of the image is in absolute adherence to Shiva’s Ananda-tandava form. Shiva’s four-armed form is usual but Apasamarapurusha – enertness or forgetfulness personified, under his feet is a characteristic feature of 'Anandatandava'. Apasamara – enertness, awaits 'Anandatandava' – dance of dissolution, to end, for after 'Anandatandava' has been accomplished and dissolution has taken place, there shall prevail nothing but inertness. Interestingly, Apasamarapurusha in this statue reveals from the gesture of its hands thoughtfulness as if meditating on how it shall act after dissolution has taken place, something which is more often represented in Nataraja iconography by a flwer that Apasmarapurusha is seen carrying suggesting that it is out of inertness the life shall re-begin. Flames of fire are another essential feature of the Ananda-tandava iconography which characterise this magnificent art-piece. Usually these flames emit from Shiva's head and palms, when in full ecstasy of dance Shiva’s body moves faster than winds. The pace of movement is the essence of Ananda-tandava. These flames symbolise explosion of ultimate cosmic energy and its dynamics, which Ananda-tandava generates. In this representation the flames do not explode from Shiva’s head but they do from one of his palms and from the fire-arch which symbolises the cosmos – Shiva’s manifest form.